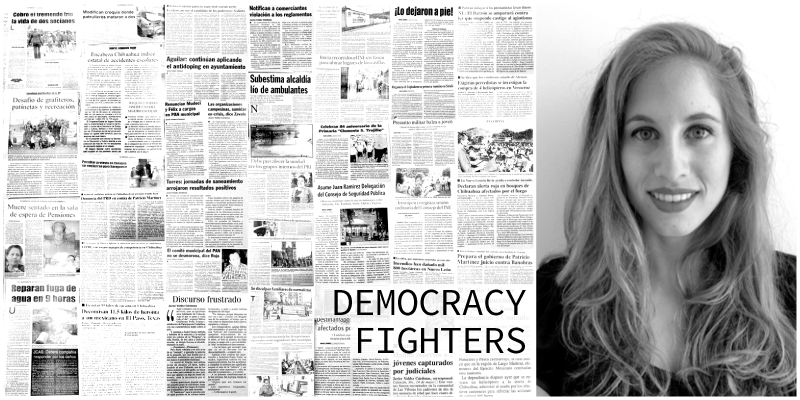 With her 2018-19 Magic Grant Democracy Fighters, A Living Archive, Alejandra Ibarra Chaoul is adding context to the circumstances and situations leading to these killings, aggregating as much information as she can about each journalist’s work and interviewing the journalists’ friends and family members. Timing is crucial — the work of these journalists is rapidly disappearing as news outlets fold and publications are erased from the web. Ibarra Chaoul’s project is an attempt to reimagine how such an expansive assortment of journalistic work, spanning across all mediums and publications, can be coupled with data about political parties and violence indicators, as well as deeply human stories about these lost journalists. Ibarra Chaoul believes that the only way to truly honor these reporters’ legacy and understand these deaths is by placing the work of the killed journalists into context. In so doing she attempts to “flip the narrative away from their final moments to their work”. To this end, she has partnered with a reporter and a historian, as well as a programmer responsible for web scraping and digitization, and together they have collected over 8,000 clips from 25 journalists and 41 publications, so far. Ibarra Chaoul and her team have expelled a great deal of energy talking to family members about the journalists who were killed. At first, it was challenging to make contact with these families, but after collaborating with The Committee to Protect Journalists, family members were much more willing to volunteer their help, Ibarra Chaoul found. Together with her team, this story-driven context will be combined with the data points they’ve collected: the years of a journalists’ professional life, the newsrooms they worked for, the clips they authored, the locations of their reporting, and the dates of their publication. They’ve also talked to academics who’ve built datasets with the names and political parties of mayors and governors, the presence of drug cartels at a municipal level, and rates of homicides per town. The entire archive will be hosted on an interactive site that will fashion a narrative from the collection for those just being exposed to the story, but will also serve as a database for more specialized audiences such as reporters or academics looking to continue these journalists’ reporting, or study the systematic targeting of journalists taking place in the country. Part of the novelty of the project, aside from its journalistic ambition, is how it merges the idea of data-collection with boots-on-the-ground reporting. ‘Data’ as it is thought of from a computer scientists’ perspective is not often portrayed so humanistically. By comparison, journalists don’t usually think of their reporting methods as data collection. Thereby, they don’t consider the practicalities of storing information on a database — practicalities that include a standardized methodology and data ‘schema’ — or format. Ibarra Chaoul doesn’t refer to the project as a database, instead naming the trove of emotional documents a ‘living archive’. The design of the site is in its early stages at this point. Ibarra Chaoul said she is excited to see how the narrative side of the archive — built out with text and images — will take shape in the coming months. She believes that the site will honor the memory of these journalists’ through its dedication to their work. Democracy Fighters is also sponsored by a gift from Lila Gault and Bill Arp.